I've been going through some art that I've purchased recently because I've just bought an A3 scanner - now I can scan those full pages. In amongst one lot was this lovely image on a piece of paper taken from one of Jim Mooney's sketchbooks. Titled 'Streaky II In Repose' it's a charming image indeed. Gotta love a man who likes cats so much he draws them as warm-up exercises and then draws them so well. More comments and thoughts on the previous post about art recreations have been coming in thick and fast so I thought I'd do a follow-up. 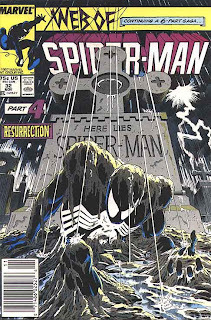 One of the first people to email asked why didn't I touch on Mike Zeck's recreations as an example of how they can be approached the right way. There's no real reason except that I thought the post was long enough, but hey - any excuse to look at Zeck art is a good excuse. 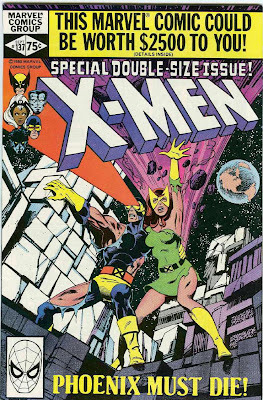 You're looking at one of the most iconic comic book covers of the last thirty years - Uncanny X-Men #137. Penciled by John Byrne and inked by Terry Austin, it's one of the most recognisable covers you can find and it's one of the most impressive covers that the famed Byrne/Austin team ever created, and that's saying a lot. Byrne and Austin worked on a number of titles over the last thirty plus years, but their true Golden Era was from the late 1970s through to the mid 1980s when Byrne left Marvel Comics for DC, and Austin inked him for an early Superman issue. A Byrne/Austin cover can set you back quite a few thousand dollars, and the right cover can cost the same amount as a brand new luxury car or even a small house. Don't believe me? Have a peek at eBay one day or just search some original art sites and you'll see what they can go for.